The official Lego Minecraft set has been such an amazing success that Lego and Swedish game developer Mojang have decided to expand the line with two new official sets: the Village and the Nether. The Village (pictured above) "fans can create and customize their own Minecraft village with Lego bricks." 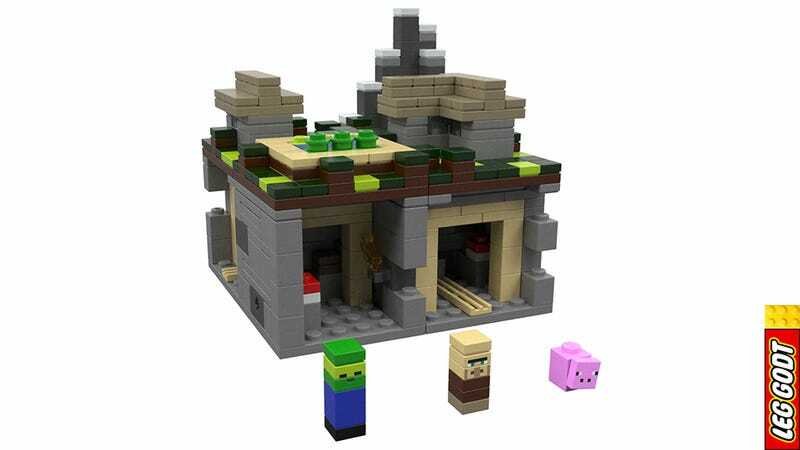 It seems to be an open set, where "fans can build houses, grow crops and explore the mines in their own micro-world as well as play out their own storylines with Pig, Villager and Zombie constructible Micromob figures." With the Nether set, "builders can create the Minecraft Obsidian Portal and The Nether to explore the newest biome with this micro-scale LEGO model, complete with Netherrack, gravel, flowing lava and bedrock. This model includes two Ghasts and one Zombie Pigman constructible Micromob figures." The new sets will be available on September 1 for $35 each.